David Kenyon Webster, author of "Parachute Infantry - An American Paratrooper's Memoir of D-Day and the Fall of the Third Reich"
David Kenyon Webster was a member of E Company, 506th Regiment of the U.S. Army's 101st Airborne Division during World War II. He was an aspiring writer who left Harvard to enlist in the paratroops. Webster wrote numerous letters to his family and, after the war ended, wrote a book about his experiences, Parachute Infantry: An American Paratrooper's Memoir of D-Day and the Fall of the Third Reich. Webster's letters home and manuscript were used as source material by Stephen Ambrose for his book Band of Brothers, and as background for the writers of HBO's ten-part miniseries, "Band of Brothers." HBO's "Band of Brothers," based on the book by Stephen Ambrose, follows the paratroopers of E Company from training in Georgia through the end of World War II. 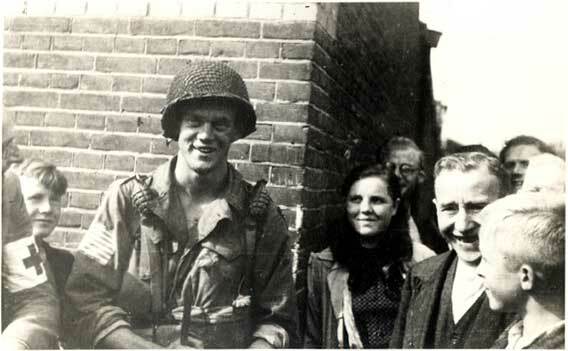 E Company jumped into Normandy on the night before D-Day and into Holland in Operation Market-Garden, fought in the Battle of the Bulge, and captured Hitler's Eagle's Nest at the end of the war. According to Ambrose, "At the peak of its effectiveness, in Holland in October 1944 and in the Ardennes in January 1945, Easy Company was as good a rifle company as there was in the world." David Kenyon Webster is portrayed by American actor Eion Bailey in Episodes 4, 5, 8, 9 and 10 of HBO's "Band of Brothers." Webster is featured in Episode 8, "The Patrol," which he also narrates. In October 2002, Random House published a revised and expanded version of David Kenyon Webster's Parachute Infantry: An American Paratrooper's Memoir of D-Day and the Fall of the Third Reich. This new edition includes over 100 pages of previously unpublished material, including 20 letters home, and restores some of the grittier language and actual names that were used in Webster's manuscript. It includes an introduction by the late Stephen Ambrose. A previous edition of Parachute Infantry was published posthumously by Louisiana State University Press in 1994. The Washington Post noted then, "Ambrose was right to urge publication of this almost-forgotten memoir. It is beautifully written and perfectly evokes life and battle in a parachute infantry company." This web site, produced by his family, honors David Kenyon Webster and his comrades-in-arms. Click on the above headings to learn more about Webster's life, his books, and his experiences as a paratrooper during World War II. For more information on the new edition of Parachute Infantry: An American Paratrooper's Memoir of D-Day and the Fall of the Third Reich, please go to the online catalogue at RandomHouse.com. Comments or questions on this web site? E-mail here.